Nothing would please me more than to see Bobby Cox walk off a field for the last time, on his way to a World’s Championship Trophy presentation (well, except maybe watching him get ejected on his way to the presentation, but now I’m just being silly). I don’t think it’s going to happen. As much as Cox patched together just enough breathing players to manage to hang on to the Wild Card, the tank is pretty empty now. The Braves were barely surviving the loss of Chipper Jones by turning super-sub Omar Infante into a regular, when Martin Prado followed Jones on to the out-for-the-year-list. This reduces the Atlanta infield to Infante, Alex Gonzalez, a Derrek Lee who has been pretty lethargic since coming over from the Cubs, and Brooks Conrad, who has shown a strong bat at the plate, but some evidence that he brings the same bat with him onto the field. Similarly the Bravos’ rotation is a mess. Jair Jurrjens turned his season around after his first injury, then came back from his second one overweight and ineffective, and then injured himself for a third time. Tim Hudson has been effective all year, but Derek Lowe and Tommy Hanson have been up and down, and heaven help Coxy and Roger McDowell if they have to rely on either Mike Minor or Brandon Beachy. The one wild card for the wild card team is production from the outfield. When you have Jason Heyward plus a combination of any two of Ankiel, Cabrera, Diaz, Hinske, and McLouth, the possibilities that Cox could catch lightning in a bottle for a short series in CF and LF, should not be discounted. But we haven’t even started trotting out names like Buster Posey or Brian Wilson or Tim Lincecum yet. The Giants, barring a dry-up of biblical proportions, should handle the Braves easily, possibly by sweep. If they don’t, they have some serious explaining to do. Similarly, as fond as I have been of the Reds’ chances since last March, I cannot see them getting past Philadelphia. The depth of Cincinnati’s rotation – such an advantage during the regular season in the fluid N.L. Central – means that they could get everything or nothing from Edinson Volquez, Bronson Arroyo, and Johnny Cueto. More over – understandably under the radar in a year of chaos, injury, and perseverance in Philadelphia – were remarkable improvements Ryan Howard and Chase Utley made against lefthand pitching. This, you’ll recall, was Philly’s undoing in the World Series last fall (particularly in the case of Howard). The cohort is not exactly small, either. Howard had 193 at bats versus lefties, 100 of them in Philadelphia. He obviously learned something. And while he went just 2-for-12 against Reds lefties during the season, one of the two was a game-winning two-run blast off Arthur Rhodes to win a game in Philly on July 9th. Howard has not seen Aroldis Chapman, but unless Dusty Baker plans to use Chapman as his specialist against lefty bats and switch Rhodes or some righthander to 8th inning duties, the onus will fall on Rhodes, not Chapman. Those numbers are even a little more extraordinary than they seem. Utley had 289 ups against righties and only 136 against lefties yet his power came against the southpaws. He has no track record against the Reds this year – 1-for-3 off Cueto in the June 28th game in which he hurt his thumb. So if the Chapman versus the Phils’ power bats thing may not really be an issue, we’re back to the idea of which trio of starters is more likely to get punished: Volquez, Arroyo, and Cueto, or Halladay, Hamels, and Oswalt? It would be a bigger upset than the Braves over the Giants if the answer turns out to be the latter. Something to do as we contemplate the irony of Aroldis Chapman escaping from Cuba to sign with a team that in the 1950’s had to change its name to the “Cincinnati Redlegs” to avoid somebody mistaking them for communist sympathizers. Who is this, captured in the endless sweep of photographing anybody in a big league uniform by Topps Chewing Gum in the 1956-1996 era? 1) I’ve been looking for this one for a long time. Never did locate it within the since-dismantled archives at Topps here in New York. 2) Yes, he’s in the uniform of the one-season franchise, the 1969 Seattle Pilots (although there are 1970 Pilots photos too – the franchise moved to Milwaukee just before opening day, as part of a bankruptcy collapse). 3) No, he never played for the Pilots, but yes, he did play in the majors briefly, but even most of his many admirers probably don’t know that. 4) Lefthanded hitting outfielder-first baseman who quickly gave it up after his brief big league stint six years later, and then moved into coaching and managing. 5) Got a big league managing job, in fact, when the man his team had hired in full anticipation that he would make the leap from wonderful pitching coach to wonderful manager, turned out to be not quite that much of a skipper. 6) Managed in two World Series but never won a single World Series game on the road. 7) Yet won both Series… okay, you’ve got it now. 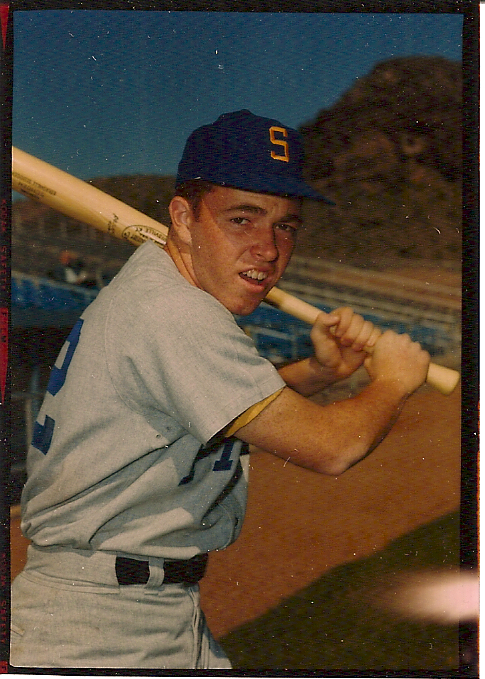 Fresh from a .317 season in the New York/Penn League in 1968, he was actually in the Pilots’ first big league camp as a non-roster invitee – and was just 18 years old when that photo was taken in Arizona in March, 1969. Yes… it’s legendary Twins’ manager Tom Kelly.